Over the years, we’ve built numerous online stores and we’ve come to love Shopify as our platform of choice. It is one of the most feature-packed of the cloud-based ecommerce solutions around and by far the most powerful. So let’s look at Shopify in a little more detail. Shopify is a cloud based e-commerce platform for retailers to sell online. Currently there are around 325,000 online stores worldwide using this platform and they process around $24 billion in sales a year. With a client list that includes Google, Tesla, Budweiser, Lady Gaga and Adele, these guys are the biggest in the business so you’ll be in safe hands. A site to reflect the personality of your business. Unlike other e-commerce systems, Shopify is completely customisable which allows us to build you an online store that matches your brand. You have complete control over everything from your domain name to the layout, through to bespoke product builders that allow your customers to build their purchase on the fly from your products. 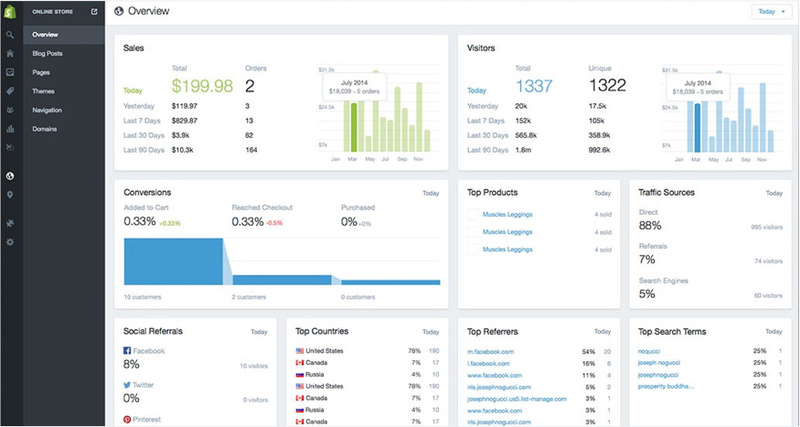 The dashboard area offers an overview of how your site is performing showing sales, orders, and traffic to help you make the right choices for your business. 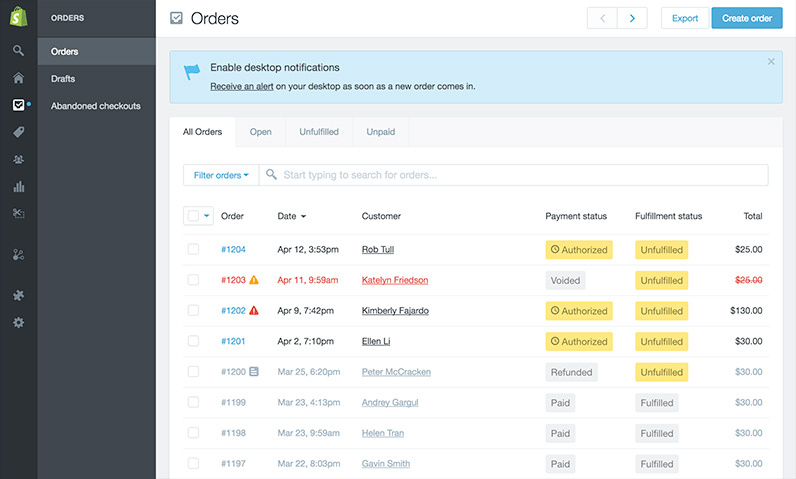 Get notified by email, or on your smartphone when a new sale comes in, allowing you to fulfil orders with just one click, making order management a breeze. All Shopify websites include social media integration, with channels such as Twitter, Facebook, Instagram and Pinterest, allowing you to easily share your products at the click of a button. The abandoned shopping cart functionality allows you to recover lost sales by automatically sending an email to prospective customers with a link to their abandoned shopping carts, encouraging them to complete their purchase. Shopify supports all current SEO best practices like customisable H1, title, and meta tags. You can run sales and promotions easily from the dashboard offering discounts to your customers. Effectively use HTML email marketing to notify your customers of upcoming sales or new products using Twist email marketing or other well-known providers such as MailChimp. Hosting an ecommerce website is a challenge, especially if you’re unfamiliar with technology. As a retailer you have to ensure that your servers are secure, up to date with the latest software, ensure PCI compliance and manage daily backups. Shopify has done all the hard work for you by providing a reliable, secure shopping cart solution for your ecommerce website. The shopping cart software allows you to accept credit card and PayPal payments, and your customers order data is encrypted and secure. Shopify is Level 1 PCI compliant and uses 256-bit SSL certificates to keep your customer details secure. All your business information, including products, customers, orders, and inventory, is backed up in a secure data centre every day ensuring you can rest easy in the knowledge that your online business is in safe hands. Your online store is not a 9-5 business so having a dedicated support team to rely on 24-7 by email, live chat, and phone is an invaluable service. The active community discussion forum is great place to get support; you can get involved in conversation with other Shopify users about marketing techniques, accounting, digital media and much more! Over the years we’ve come to love Shopify. It is one of the most feature-packed cloud-based ecommerce solutions around and by far the most powerful and secure. And with packages starting from £23.00 a month it’s also incredibly affordable. Shopify allows us to create beautiful bespoke designs whilst giving you a flexible and easy to use management system, which is why it’s the only ecommerce platform that we recommend.